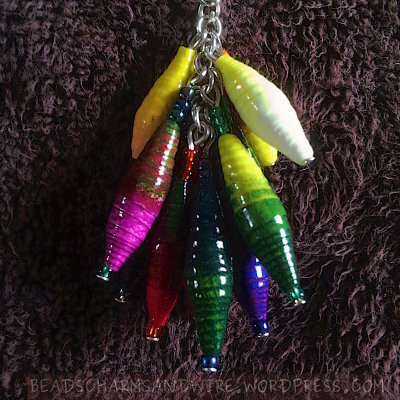 I first thought of making keychain charms from the cuboidal Natasha beads, and they didn’t have to be super-perfect. In fact, I had to cool the clay multiple times in the refrigerator to be able to slice it without squishing it. (It’s still a bit squished, though :) but like I said, I didn’t need the pieces to be perfect.) I attached eye pins before baking, securing the pins by bending them slightly before inserting into the beads. I sanded and buffed the beads so they’re smooth. (Sculpey III doesn’t ever end up with a shine.) When I showed them to my folks, they thought they’d make great earrings. So my sis picked two beads that are more similar than the others (at least in size — these beads never turn out the same!) and I ended up making an earring pair and two keychain charms! While I was on a random Internet ‘walk’, looking up stuff I’m interested in, and occasionally stumbling upon other interesting stuff, I came across an art bead challenge on Art Elements. The challenge showcased sugar skull lampwork beads made by Jen Cameron from the Art Elements team, and select designers would use the beads in their pieces. I wasn’t going to participate in the challenge since I have miles to go before I reach there, but the sugar skull beads caught my attention. Sugar skulls are made for Day of the Dead celebrations, and though I’ve never come across a sugar skull, I thought I could try my hand at making one with Polymer Clay. I’ve only been making discs and cylinders so far, and I wanted to try some mild sculpting. And while I’m at it, I wanted to practice some new Polymer Clay stuff, and sugar skulls have a lot of decorative components in them so it’d be the perfect opportunity to try a couple of new techniques. I started on the skull in the middle of this month. I used various shades of pink since October is Breast Cancer Awareness month. But I got sidetracked, and could only finish it today. 😦 Well, it’s still October today, and better late than never. This skull is not a bead; it’s open and hollow on the back. And it involved a lot of sculpting — most of it ensuring that the skull’s shape is symmetrical. Also, as you can see, I’m pretty bad at using paints for drawing — I can only ‘draw’ dots well 😉 but hey, let’s not stray from how I fared at learning Polymer Clay stuff! I made a rose to fix over one eye socket, and I can’t believe how easy it is to make one. Flatten clay bits for petals, and stick them one over another in layers until the flower is as big as you want it. And then, I went through some appliqué videos, and made the flower petals around the other eye socket with tiny clay balls and a flat clay tool. What I couldn’t fix was some glitter that got stuck to the piece while I stored it in a ziploc. Obviously, that bag held something else earlier. The glitter doesn’t spoil the piece, though, so I just let it be. When I decided I didn’t want to try out any more techniques on this piece, I poked a hole at the top to run a cord through, baked the piece, drew some decorative dots and curves, and applied a layer of mod podge for some shine. Overall, I’m pretty chuffed with this piece! Other than the sculpting, a lot of the claying was making tiny components, and I’m pleasantly surprised with all the tiny parts I was able to create. 🙂 I don’t think I’ll sculpt more anytime soon though. There’s just too much shaping and going over the same surface a million times and wiping little dents and fingerprints. 😛 I’ll definitely work on the two techniques that I used for the flowers, though — I like those. My mom suggested using this skull for a keychain… Ooh, now that would be cool — if I end up using the keychain, it’s going to be a complete departure from my paper bead bunch keychain! 🙂 I should probably close up the skull in that case. What do you think?